Man on Wire has been sweeping through the documentary awards this season and though I've only seen a handful of this year's docs, it's easy to see why. It's designed more like a well-made heist story, only the thing being stolen is a few moments of fame not anything of monetary value. James Marsh masterfully combines real and re-created footage to tell the story of Philippe Petit, a French wire performer/artist. Petit wasn't the type of tightrope walker you might see inside the big top of a circus: He lived for the thrill of scaling well-known landmarks, outside and full of risk to himself ranging from mere arrest to life itself. In the early 1970s, Petit became obsessed with the then-under construction World Trade Center and became determined to display his unique art between its towers, 1,350 feet above the ground. Petit himself is a delightful character in contemporary interviews as he and his collaborators recall the details of their adventure and Marsh builds incredible suspense as they scheme and plot to set up their daring stunt. One would think that it would be easy to squeeze some pathos out of the mere presence of the towers that are no longer there, but the interviewees and director never mention 9/11. 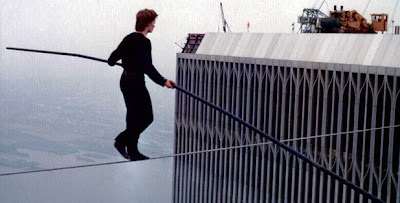 I think that makes Man on Wire even stronger as you can just gaze at the lost majesty of the buildings, though it's hard not to get a shiver when an otherwise innocent shot of the towers shows an airliner flying by in the background. Man on Wire doesn't end up being about one man or one incident, but tosses in reflections on fame, love, art and friendship as well. That's a helluva lot for a 90-minute documentary to pack in and to pull off well. Well at least we agree on this one...I really liked Man on Wire...its really exciting!